Autumn is one of the most beautiful times of year. With bright foliage, colorful squashes and pumpkins, and beautiful sunflowers and mums, its fiery, golden color scheme is an amazing example of natural beauty. 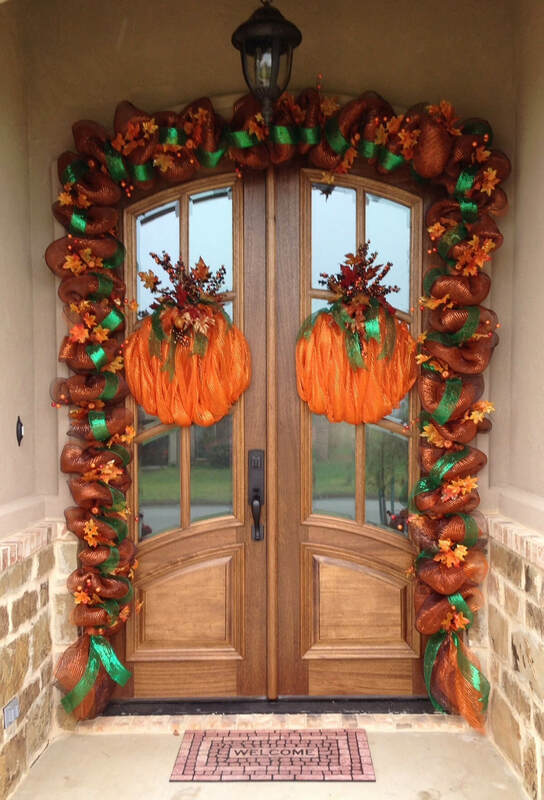 If you want to bring a hint of that beauty to your home, try one of our gorgeous fall front door decor ideas! Whether you want a spooky Halloween scene, a classy all-white set-up, or a colorful arrangement of autumn plants, we have the perfect idea for your porch. 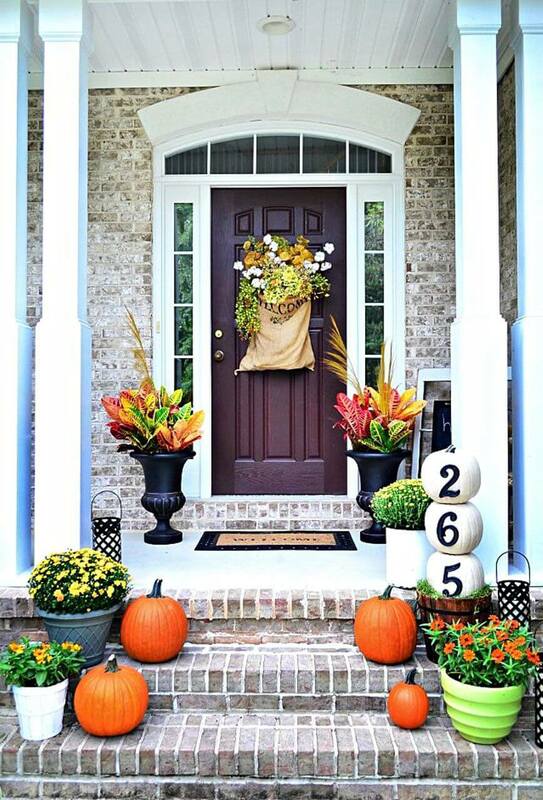 Many of these fall front door decor ideas utilize the planters you use all year long to display pretty pumpkins. Want a more rustic look? Try one of our ideas featuring wooden signs, apple crates, and corn stalks. For a unique and festive appearance, we have tons of DIY garland ideas. 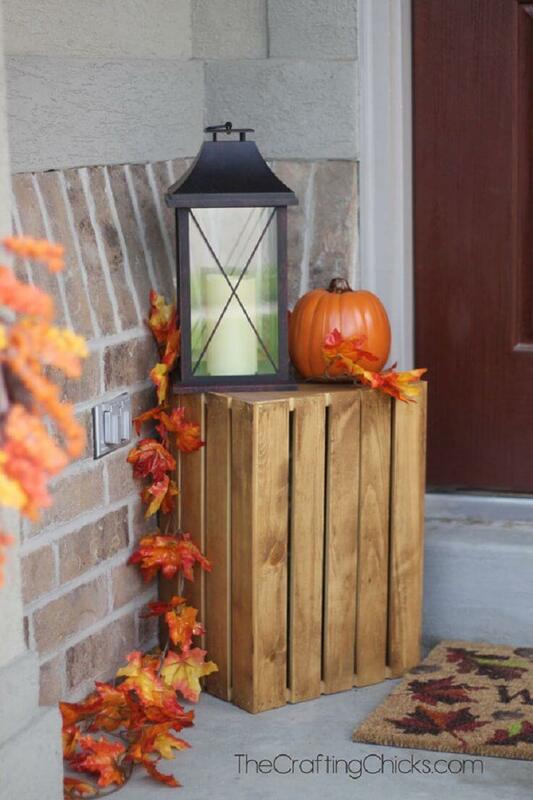 These are ideal for making your house look welcoming for autumn guests or trick-or-treaters! If you live in a smaller space, never fear! Our mini displays, festive wreaths, and fun door decor suggestions look just as photo-worthy as the larger set-ups on this list. No matter which you choose, your outdoor decor is sure to remind everyone of apple-picking, hay rides, and cozy nights by the fire. 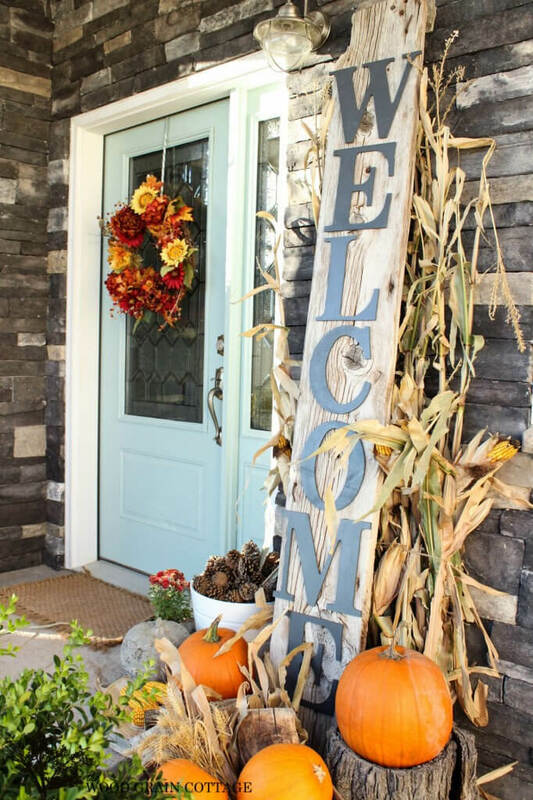 Read on to learn more about all 25 of our amazing fall front door decor ideas! 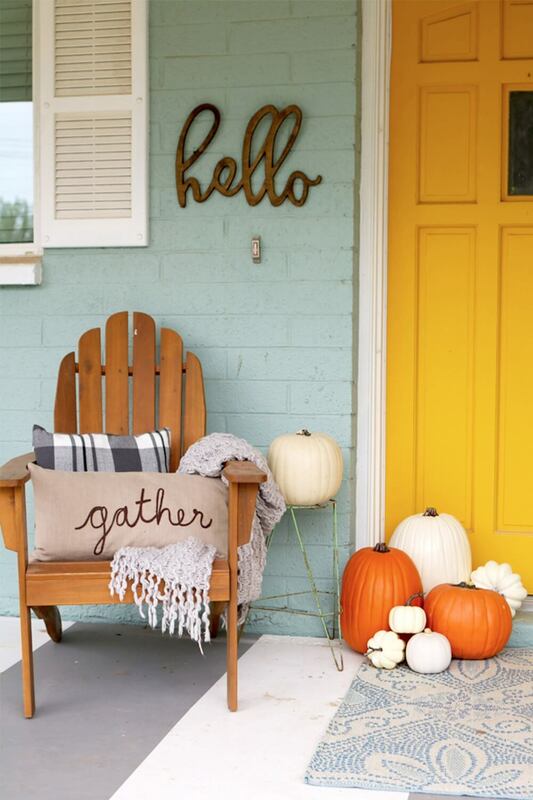 Introduce the autumn season to your front door decor with a lovely and welcoming falling “Fall” sign. To achieve this look, use wooden letters, found in arts and craft shops, and tie strips of fabric, stapled to the top of the door, around the letters. This look also includes “pumpkin men” alongside each door created with decorated and stacked tri-colored pumpkins and gourds. This woodsy style welcome sign will make any guest feel invited to your home. The look is achieved with large black letters spelling out the word vertically hot-glued or stapled to a long plank of wood and surrounded by pumpkins. The front door is decorated with a beautiful floral wreath with flowers in fall colors like red, orange and yellow. Step into the season with this unique ladder display for your fall front door decor. 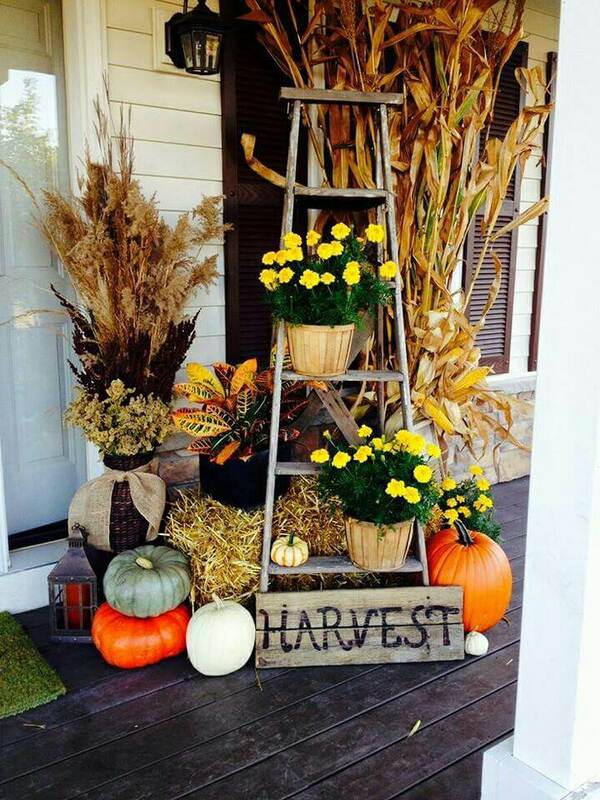 A rustic ladder is used as a display piece for colorful floral arrangements in fall colors of yellow, orange or red. Hay and pumpkins adorn the sides of the ladder. Vases of corn stalks also add to the spirit of the autumn season. Decorate the steps leading up to the front door of your home with a vast arrangement of harvested plants. Use a plethora of pumpkins, gourds and chrysanthemum flowers in a multitude of colors as a cascading staircase display of autumn glory to invite the energy of fall to your family and guests. This intriguing arrangement is a delight to the eye. 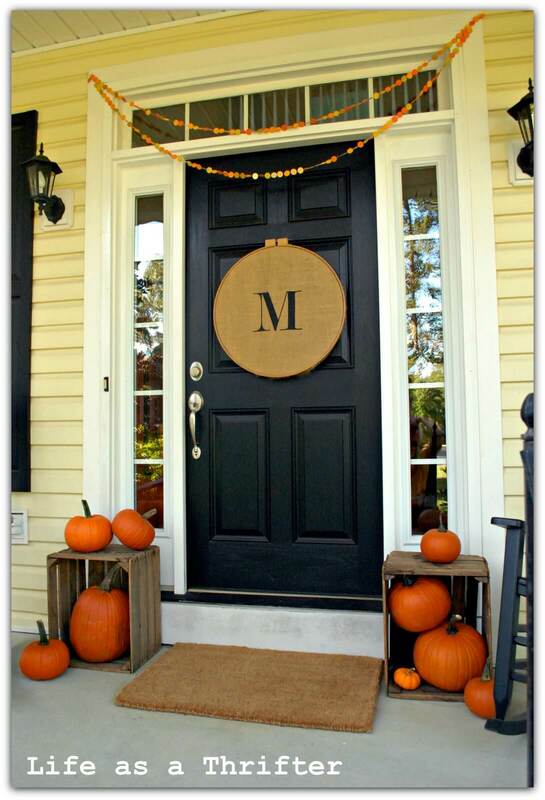 If you are drawn to a minimalist autumn front door decor, this simplistic display is perfect for you. Place a simple wooden chair decorated with beige fall blankets and pillows to bring a comfortable and homey vibe to your front porch. A lovely pumpkin arrangement brings together the fall look and adds a burst of color to the overall design. 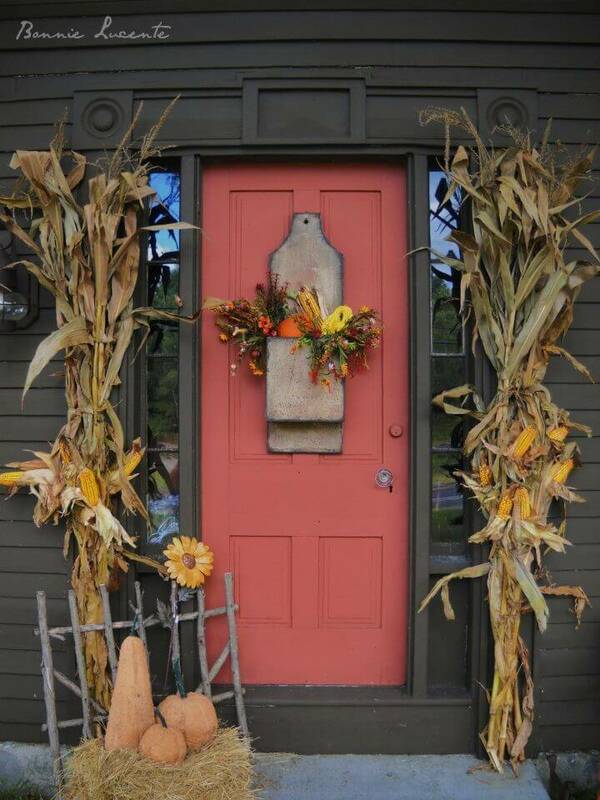 For a rustic fall front door decor, this design is a wonderful start. A ladder with the word “boo” spelled vertically down the rungs can be created with supplies from your local arts and crafts store. A haystack with a simple pumpkin and gourd arrangement makes a great centerpiece. An autumn floral wreath and a vase of corn stalks accent this look. This dramatic fall display is a beautifully welcoming front door decor to whisk in the fall. 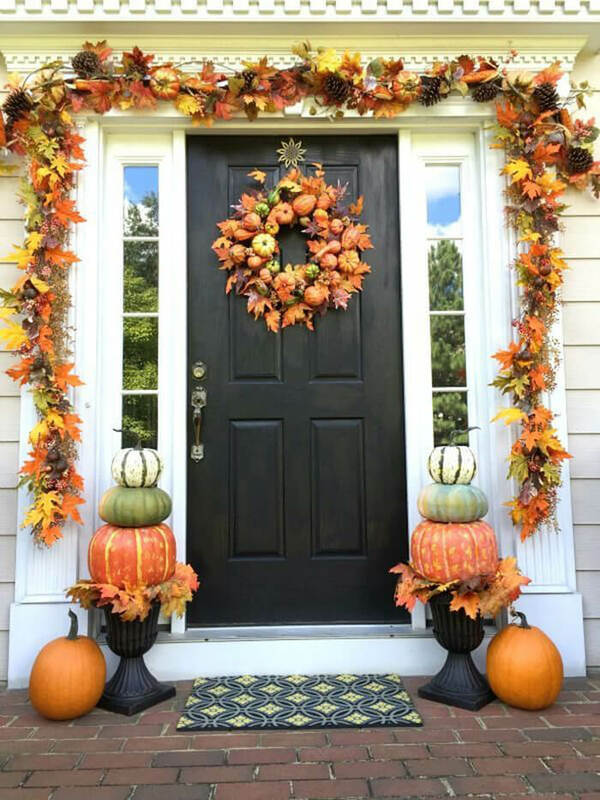 The grand garland surrounding the door and the centered wreath is decorated with flowers, pinecones and baby pumpkins enclosed with multi-colored fall leaves bringing a burst of autumn beauty to your door. 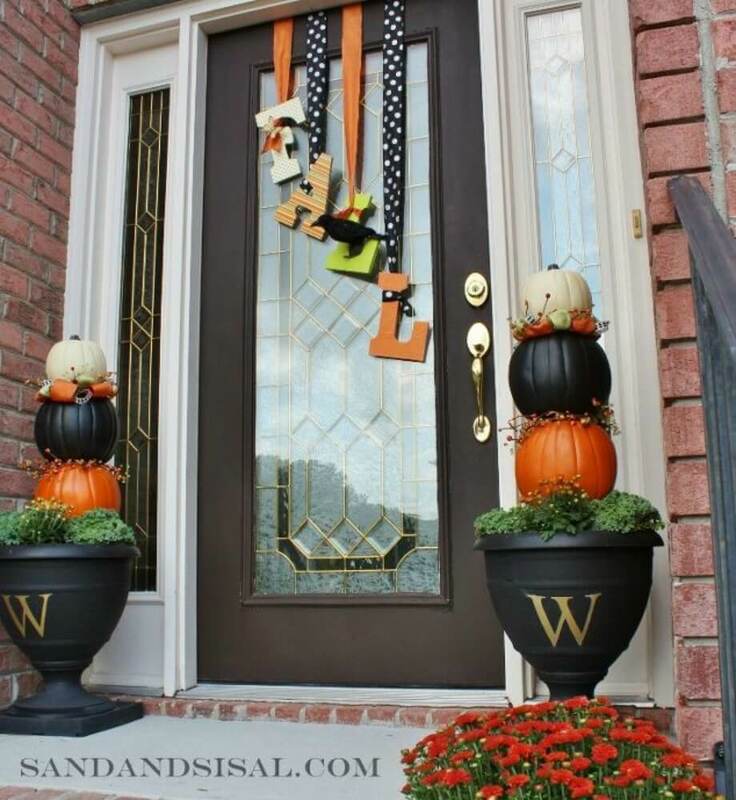 The sides of the door are complemented with colorful pumpkin arrangements. There’s nothing that spells out fall like the image of a pumpkin. This super cute pumpkin design is easy to make and fun to look at. A wooden pallet is stained with a white background. Over the white background, an adorable pumpkin is painted to create this appealing autumn themed sign. A petite orange pumpkin accents the front door decor. A basic apple crate makes a great surface for a simple fall set-up. Upon the crate sits a clean lantern with a white candle next to a petite pumpkin. Colorful fall leaves cascade down the side of the crate bringing additional color to this modest decor. 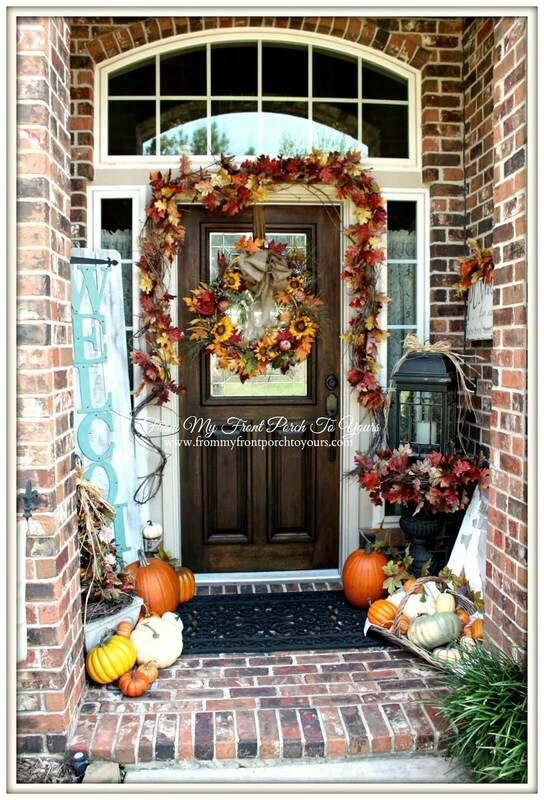 This sweet front door decor is a magnificent minimalist design to accent the season. 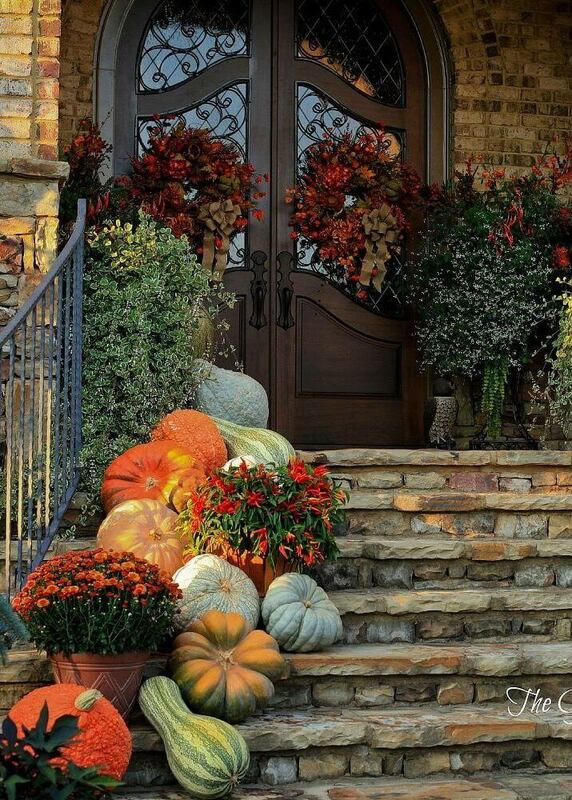 Pumpkins adorn the steps leading up to this lively fall front door decor. Potted plants bring color to this energetic design. On the front door is a sack of harvested plants representing the beauty of the autumn season. A vase with stacked white pumpkins have large black house numbers hot-glued to the front for a unique welcome to your home. Bring the harvesting fields of fall to your front door with this exuberant design. 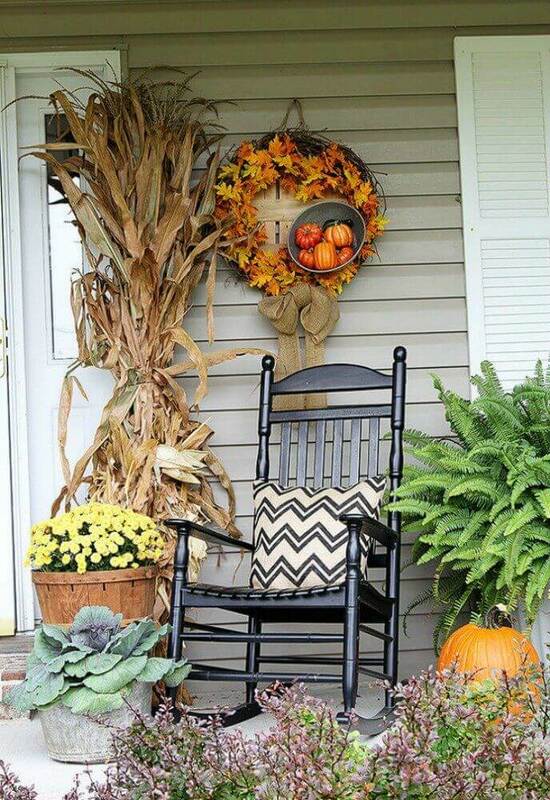 Haystacks holding potted plants and surrounded by pumpkins welcome the energy of the harvest to the front porch. 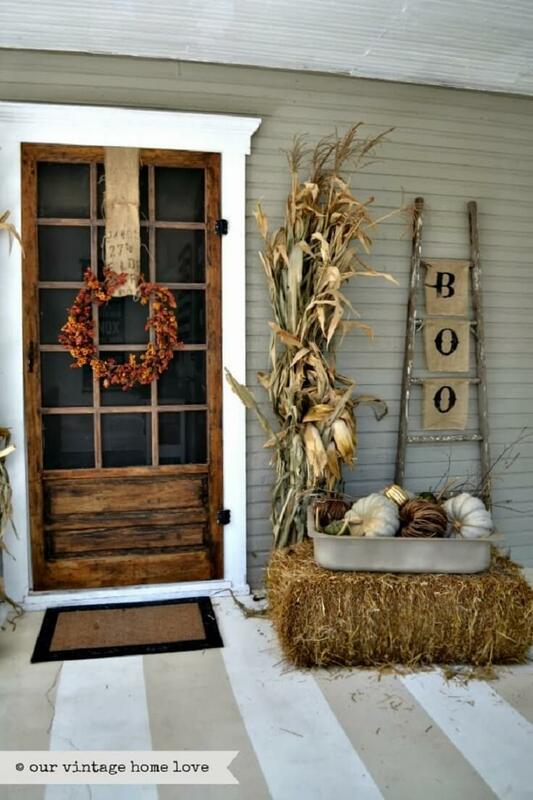 A cool scarecrow on the side of the front door protects your harvest and invites in guests with style. Long, lovely corn stalks finish off this creative theme. 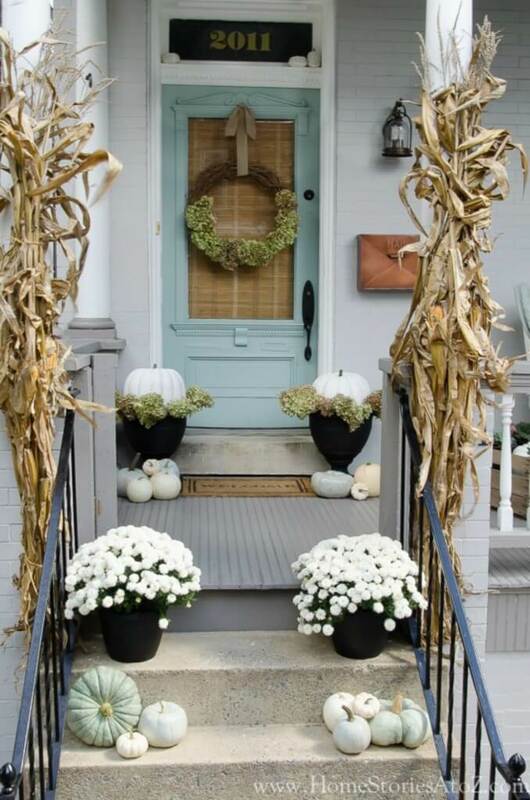 Clean white pumpkins serve as a basis to this extravagant autumn front door decor to create a classic look. Potted white chrysanthemum adorns each side of the steps leadings to the door along with rustic vines creating a framed entrance. A pretty, simple twig and greenery wreath decorate the front door as a warm welcome for your guests. 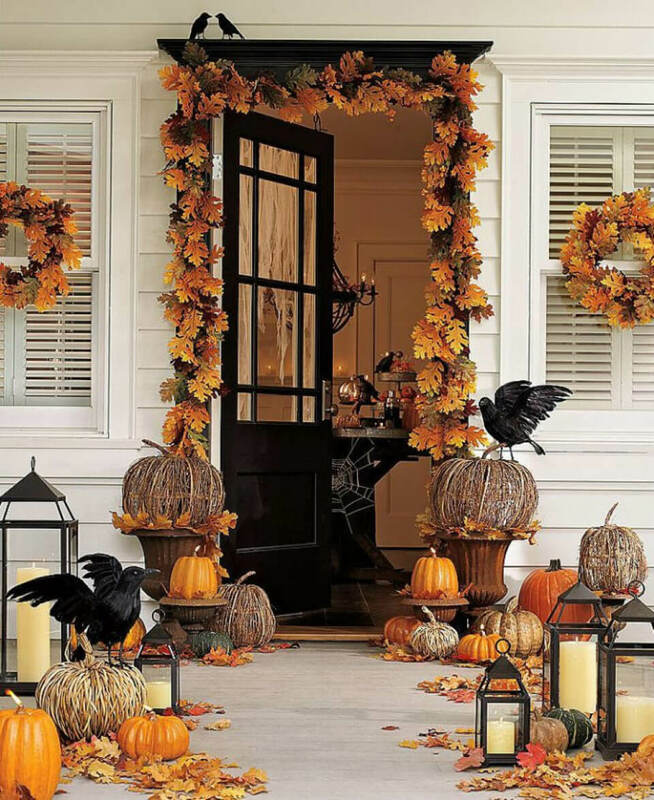 If your favorite part of fall is its eerie feel, this front door decor will absolutely delight. Wicker pumpkins are a base to this fun design alongside fresh pumpkins. Lanterns holding white pillar candles accent the porch as perched black ravens prepare to take flight. Colorful leaf wreaths adorn the windows and doorways to splash the scene with vivid color. This modest rustic autumn decor centers around an arrangement of wooden pumpkins. Across this rustic porch are unique coiled lanterns holding jars for candles. Painted white pumpkins add an exceptional aesthetic to offset the wood and grey backdrop. A wreath on the door and statue raven complete this autumn themed front door design. Looking to bring some fun and a bright smile right to your front door? 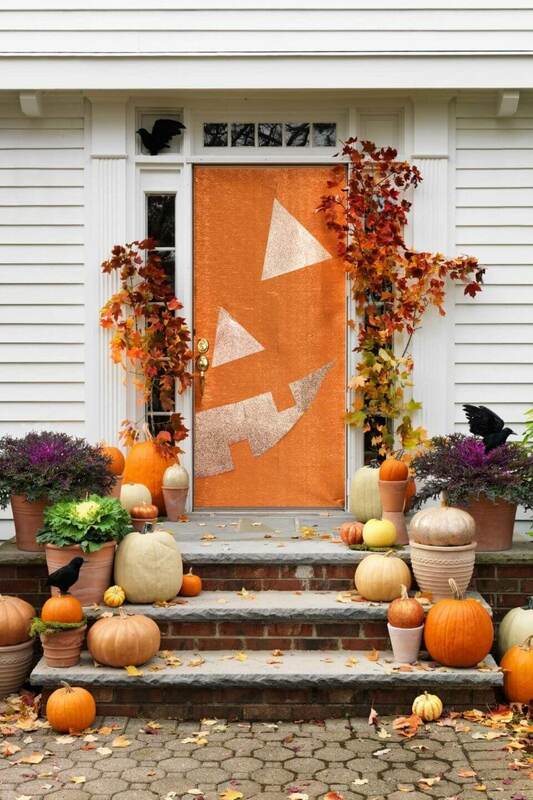 Look no further than this grinning jack-o-lantern full door papering to decorate and bring energy to your home. 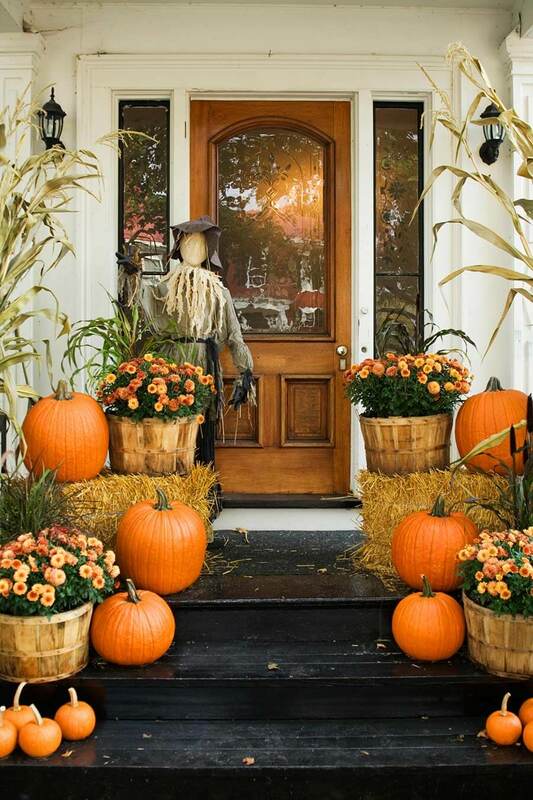 An assortment of pumpkins arranged around the front door add to the fall vibe. Large, leafy branches create a warm entrance into your home. A lovely twig wreath with vibrantly colored leaves adorns the front door. A large beige bow hangs from the bottom of this great arrangement. A bowl of petite pumpkins and gourds accent and bring flavor to the overall wreath. This simple yet beautiful wreath design is small but packs a big punch for the autumn decorative season. 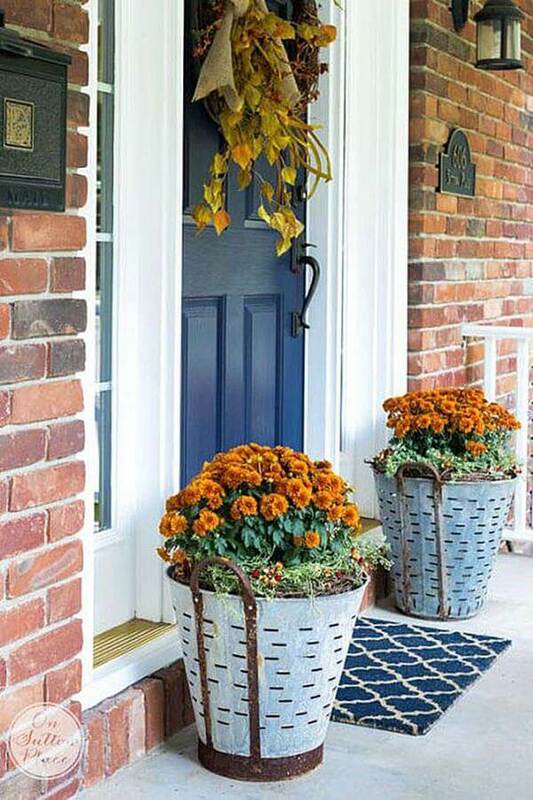 These galvanized metal buckets are unique potted plant holders to show off your vibrant chrysanthemum floral arrangements. This modest yet strikingly beautiful display along the sides of the front door create an inviting and warm entrance for your family and guests. Allow these cute planters to set a gentle tone for all your holiday gatherings. Create an absolutely adorable decor with these abundantly creative autumn planters. Large black vases give a base to colorful fall leaves and tri-sized grand pumpkins imprinted with monogram letters. A cute paper bow atop the pumpkins add an extra element of creativity to this look. A large dramatic eye-catching wreath on the front door is a perfect centerpiece to complete this look. Welcome the harvest to the front door with this enigmatic front door design. High corn stalks with harvested corn stand as pillars to invite you into the gateway of autumn. The branch gate is a unique style detail decorated with a haystack and gourd arrangement. 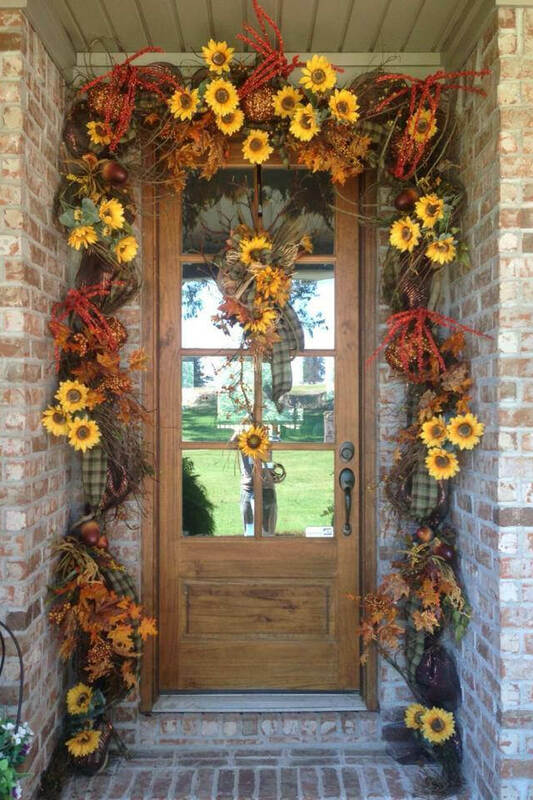 On the door is a cornucopia of flowers, corn, pumpkins and leaves flowing over as a symbol of abundance. Allow this wonderfully vibrant and dramatic sunflower and leaf garland to welcome your guests into your warm home. The colors green, red and yellow marry together in this grand display that will surely impress and delight the eye of anyone who sees it. Arts and crafts shops are a great place to begin to start this lovely display that fully represents the spirit of the fall. The leaf garland makes a wonderful statement as an earnest entrance to your fall themed home. The lively leaves add a burst of grand and exciting color to your front door design. 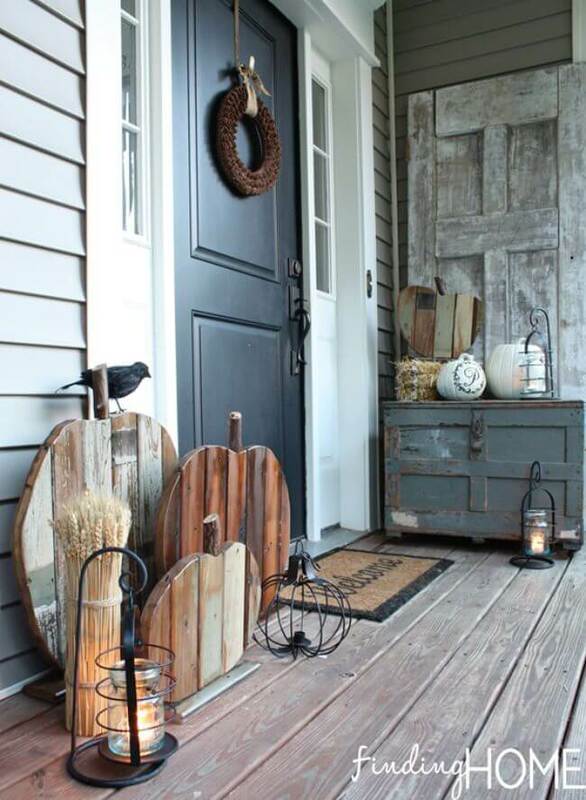 A wide assortment of pumpkins placed across the porch bring a harvested feel to your door. The large black lantern with a pillar candle complements the overall appearance. This vibrant and wonderfully unique ribbon garland boldly displays the orange and green colors in a dramatic way. A way to achieve this look is to thread thin string through the vast ribbon to hold them together and use leaves to accent this amazing garland. 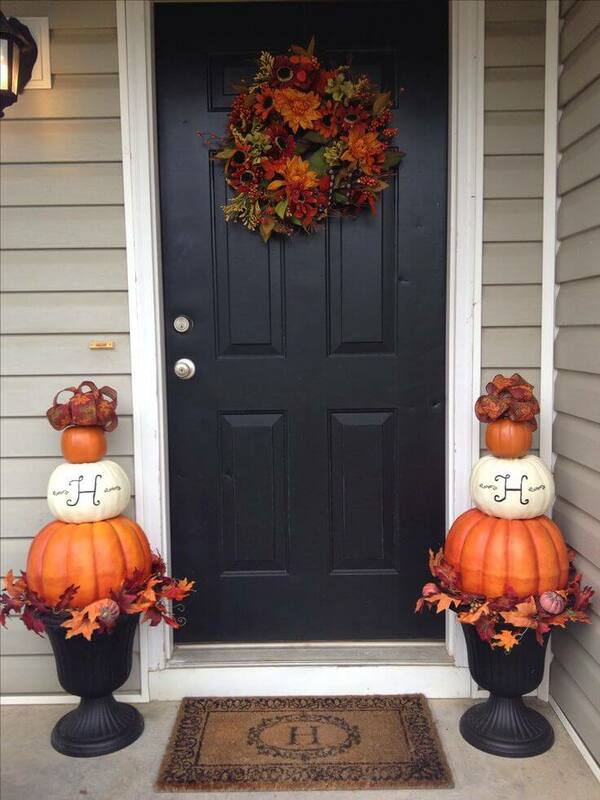 Creatively made pumpkins adorning the front door finish the look. A simplistic autumn front door design can be easily achieved with this minimalist look. 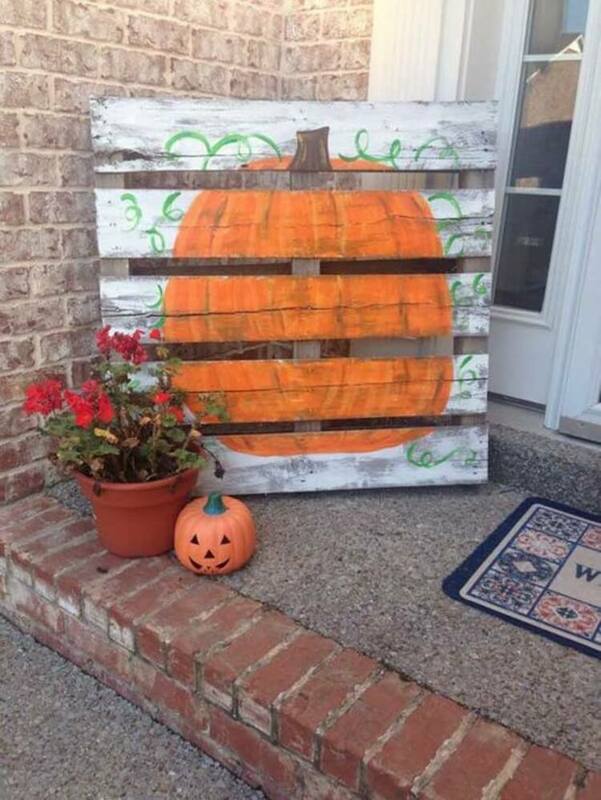 Lovely apple crates along the sides of the front door house pumpkins of varying sizes. The centerpiece monogrammed letter on the door displays proudly the initial of your family. This simple look will make a great impact on your guests.